The Lesser and Greater Butterfly Orchids are very difficult to tell apart being similar in size despite their common names which would suggest otherwise. Growing to between 20-30cm tall this orchid has two narrow leaves at the base of the plant with several more small bract-like leaves higher up the stem. The inflorescence is cylindrical when full open and each one carries up to 25 flower. The flowers are whiteish-green and the sepals and petals form a 'hood' above over the column. There is an elongated spur at the rear of flowers, and the lip is long and strap-like. 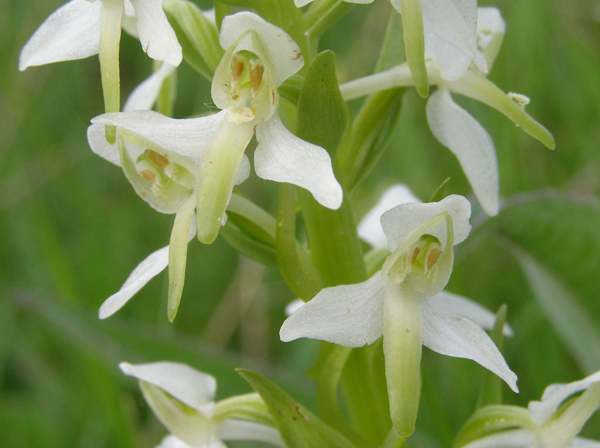 The pollinia are white (turning brown with age) and are parallel, unlike those of the Greater Butterfly Orchid Platanthera chlorantha which form a V-shape. Close inspection of the pollinia is the only way to be certain of accurate identifcation of these two orchids. 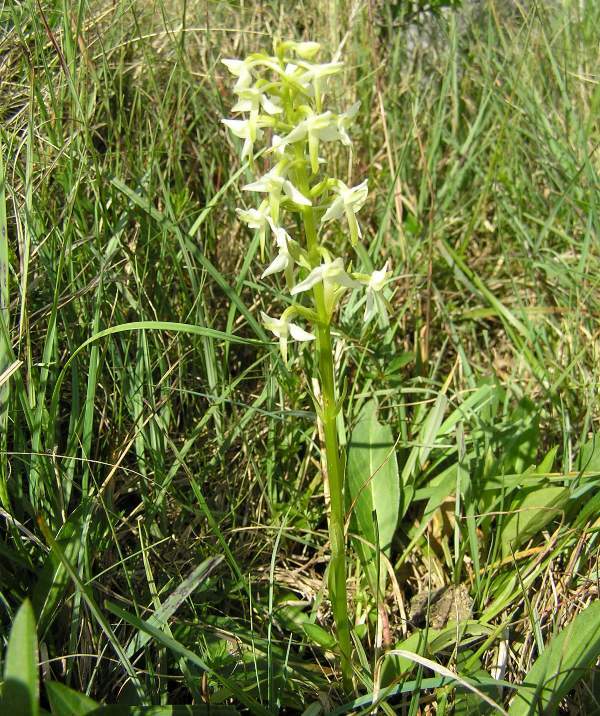 Lesser Butterfly Orchid is in steep decline throughout its range which includes the UK, Europe, Asia and North Africa. This orchid occurs on heathland and in boggy ground. It also grows in woodland on calcareous substrates, and in open alkaline meadows. June to the end of July. The specimen shown above was photographed in a South Wales Nature Reserve, (Cae Blaen Dyffryn,) near Lampeter in June.